The Atlantica Expeditions is in the process of constructing the first undersea habitat ever constructed from a Kevlar composite structure. The material was selected for several reasons. While Kevlar is five times stronger than steel in most applications, underwater, it is reported to be up to 20 times stronger. In fact, because of this, Kevlar lines are used to suspend undersea listing devices in the deep ocean to detect enemy submarines. The Expeditions selected Kevlar not only for its exceptional strength, but also for the ability to shape it using various marine epoxies to any form imaginable, making it possible to have aesthetically exciting geometries with unusual strength. We also selected the material because of its ability to withstand point source penetrations, which is actually its most advantageous design characteristic. As most already know, Kevlar is used for protection against knives and even bullets. The Expeditions received a shipment of Kevlar yesterday from our newest major corporate sponsor, BGF Industries in Atlavista, Virginia. Why is Kevlar so strong? A single Kevlar polymer chain could have anywhere from five to a million segments bonded together. Each Kevlar segment or monomer is a chemical unit that contains 14 carbon atoms, 2 nitrogen atoms, 2 oxygen atoms and 10 hydrogen atoms. The hydrogen bonds greatly strengthen the polymer chain. Kevlar is a magnificent material due to the way that it can disperse the energy and force of an object by its chemical composition. As we know from physics, the pressure that an object exerts on another object is equal to the force divided by the area. 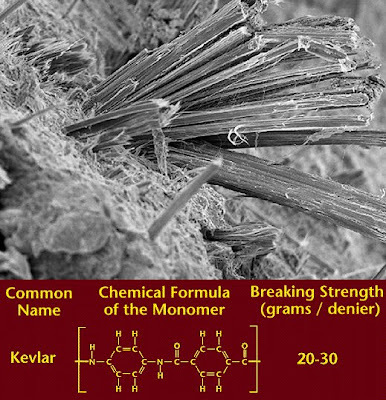 Kevlar is remarkable at absorbing and displacing the pressure of an object. Lightweight and flexible, Kevlar has evolved over four decades of innovation to do everything from helping save thousands of lives around the world to helping make safer homes and vehicles to helping land spacecraft on Mars. We certainly are exciting about welcoming BGF Industries onboard and about constructing the first Kevlar habitat whose design purpose is to test other advanced undersea technologies enabling the first permanent human presence in the oceans.